1 medium green capsicum, seeded and chopped. 1/3 cup green peas, boiled and mashed lightly. 4 medium potatoes, boiled and grated. 1/2 tablespoons pay bhaji masala. 2 large tomatoes, seeded and sliced. 1/2 cup grated processed cheese. 1/2 teaspoon red chilli powder. 1. To make the pay bhaji, heat the oil in a non-stick pan and add three-fourth of the onions. Saute on medium heat till light brown. Add the green chillies, ginger paste and garlic paste. Sauté for half a minute. 2. Add half the tomato and cook on medium heat for three to four minute string continuously or till the oil separate from the masala. 3. Add the green capsicum, green peas, cauliflower,potatoes and one and a half cups of water.Bring it to a boil and simmer for 10 minutes.Pressing with the back of the spoon a few minutes. Till all the vegetables are completely mashed. 4. Add the pav bhaji masala, salt the remaining tomatoes. Cook on medium heat approximately two minutes. Stirring it continously. 5. Place the bhaji in d kadai and simmer five to ten minutes, stirring often, till all the mositure evaporates and the bhaji is dry. Add the fresh coriander and mix. Transfer to a bowl and set aside. 6. Combine the ingredients for the onion cheese mixture in a bowl and set aside. 7. Heat a tawa and lightly warm the tortillas to both the sides. 8. Place a warmed tortilla on a square piece of aluminium foil. 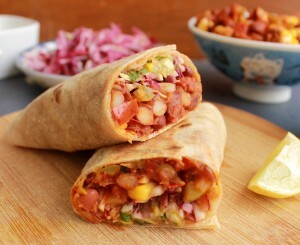 Spread one-fourth of the Wrap over the tortilla and generously sprinkle d fourth of the onion-cheese mixture over it. 9. Place two lettuce leaves on one side, of the roll and roll it up tightly. 10. Fold in the foil and serve. Make the remaining, roll-ups in the similar way.